THE MOST DANGEROUS THING YOU CAN SIGN is a “standard” selling agreement. Thousands of sellers make this mistake – they signup with an agent without realising what they are doing. Once you sign, you are at the mercy of the agent. You have lost control. That’s why many agents describe sellers as being “controlled” – it means the agent has control. Agents may say their agreement is “standard”. But it is designed to the agent’s standard, not to your standards. It totally protects agents. It barely protects you. Be careful. An agent’s selling agreement is a legal contract. Treat it seriously. YOUR SOLUTION…DON’T SIGN ANY CONTRACT unless you are GUARANTEED that your basic rights are protected. Seek independent legal advice or use the Home Sellers Protection Guarantee which has been designed in consultation with legal experts and consumer advocates. 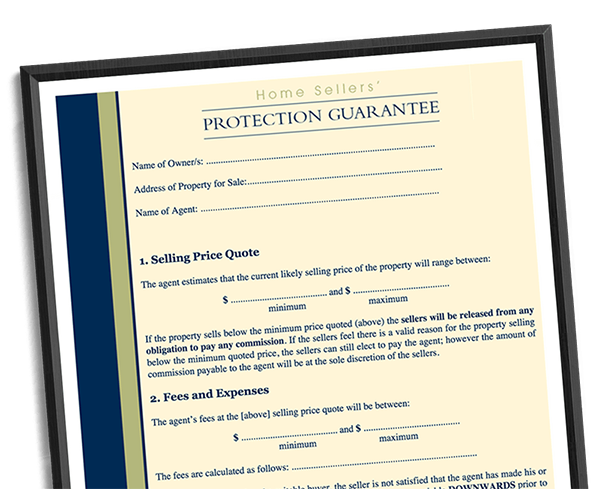 This Guarantee is available to all home sellers at no charge and with no obligation. Despite what some agents may say, you can use it with any agent in any area. This Guarantee has huge support from consumers, lawyers and consumer advocates. It has been described as a “lie detector” test for agents. The Guarantee prevents the agent from hurting you. If an agent does not want to sign it, do not hire the agent, no matter what you are told. To receive a copy of the Real Estate Home Sellers Protection Guarantee call our office on 1300 915 404.